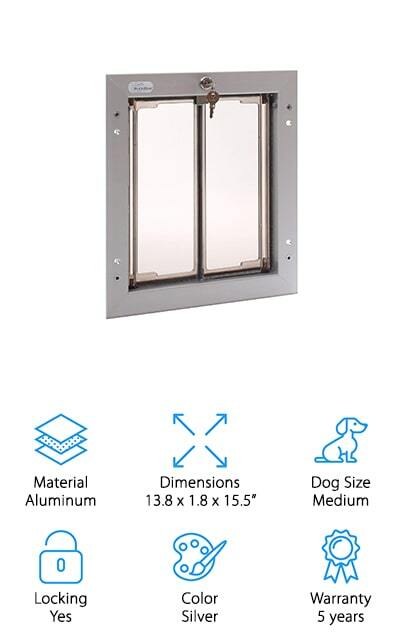 There are a lot of options when it comes to dog doors but if you’re looking for simple products that easily install into an exterior wall or door, you’re in the right place. While you won’t find the best electronic dog door here, we put in a lot of time researching manual doors to find the ten best products for you. Before we get started, let’s take a look at some of the features you should keep in mind. Material: Most of these doors have a plastic, vinyl, or aluminum frame and a flap that’s made of plastic or plexiglass. Each has their perks, like aluminum is exceptionally tough and some plastics can be painted to match your home. Dimensions: These are the dimensions of the door itself, not the flap, and they can vary pretty drastically from product to product. 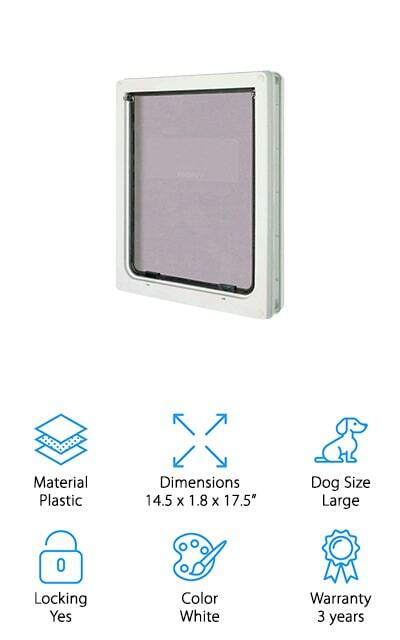 This tells you how much space the best automatic dog door will take up in your wall or door. Dog Size: We found doors for dogs of every size, from small breeds to super large ones. There isn’t a consistent measuring system between brands so make sure you look at the specific measurements of the opening for the door you choose. Locking: This is particularly important for large doors that are potentially large enough for a person to fit through. Plus, you can make sure your dog stays inside when you want them to, like at night or inclement weather. Color: Most of these doors come in white, though a few are available in different options. Keep in mind that, depending on the material, you may be able to paint the trim to match the interior or exterior of your home. Warranty: Warranties on these products vary pretty significantly. All but one of our picks has one and the range anywhere from 1 to 10 years. Make sure you read the fine print so you know what’s covered. Now that you know what to look for, let’s take a look at our top picks. If you’re in a hurry, make sure you check out our top and budget pick first to get a good idea of what’s available. Although we did not include any electronic dog door reviews, we did find a lot of options including the best sliding door dog door. They’re all worth checking out so, without further delay, let’s get right to it. 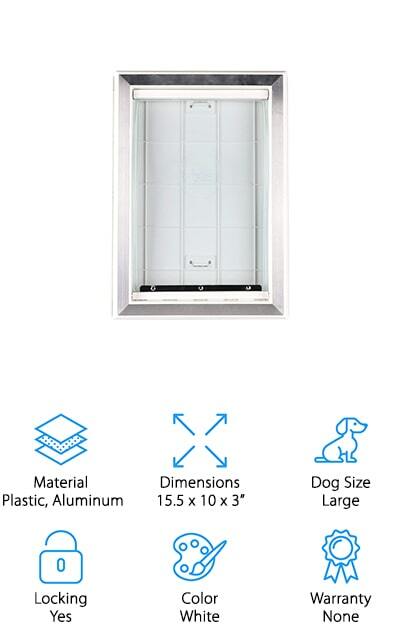 Our top pick is the best through wall dog door, the Endura Flap Pet Door. This flexible, safe design is insulated to keep the temperature just right in your home. This version has a double-walled flap so it provides protection from even the coldest weather. This door can be installed in various exterior wall materials, including stucco and siding, and the tunnel section is adjustable for walls up to 8-inches thick. The extruded aluminum frame looks clean and polished plus it’s really durable. It’s available in black, white, and tan so you can choose the one that matches the exterior of your home. A sturdy locking cover is also included for when the door is not in use. The aluminum frame comes with a 10-year warranty while the flap is covered for 15 years. The PetSafe Extreme Weather Pet Door is our budget pick but that doesn’t mean it isn’t packed with awesome features. The best thing about this door is that they use a one-of-a-kind 3-flap system that’s super energy efficient. How does it work? In addition to the interior and exterior flap, there’s also an insulated center flap. It’s 3.5 times more energy efficient than single flaps and perfect for homes in extreme or changing climates. It keeps the heat inside during the cold winter, the air-conditioned air in the summer. 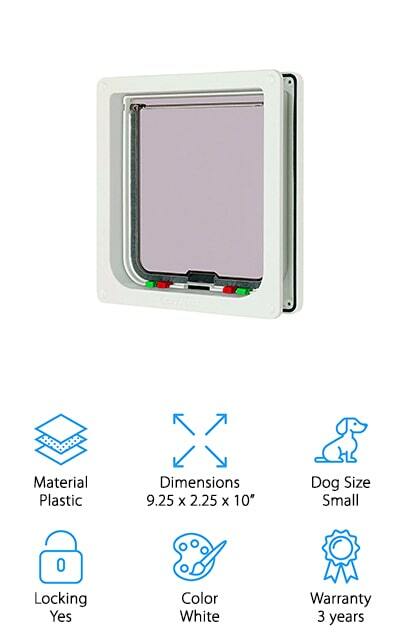 A snap-on interior panel is also included to prevent your pet from using the door. One more thing, this door is made of plastic and can be painted to match the interior and exterior of your home. Next up is the Plexidor Performance Pet Door. This one has a durable silver aluminum frame that will match nicely with your appliances should you choose to put it in your kitchen door. Something that’s different about Plexidor is that instead of using panels, they use saloon style doors made of plexiglass. They’re extremely energy efficient and very secure. Want to know the best part? They don’t need replacing as often as regular flaps do. Not only is this door equipped with a lock and key, but it also comes with a security steel plate so you can make sure your home is secure at night. 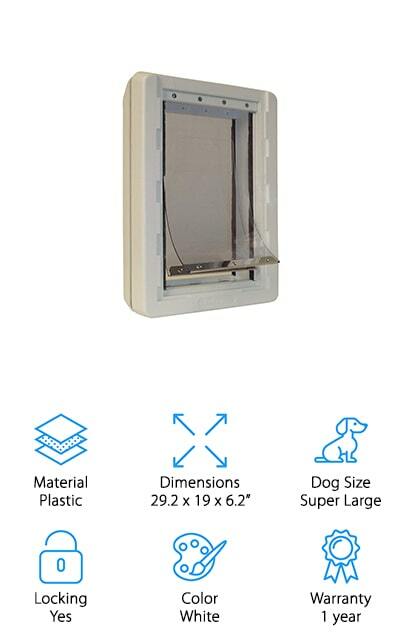 This medium-size door is best for dogs weighing up to 40 pounds, breeds like poodles, shelties, cocker spaniels, and some terriers. 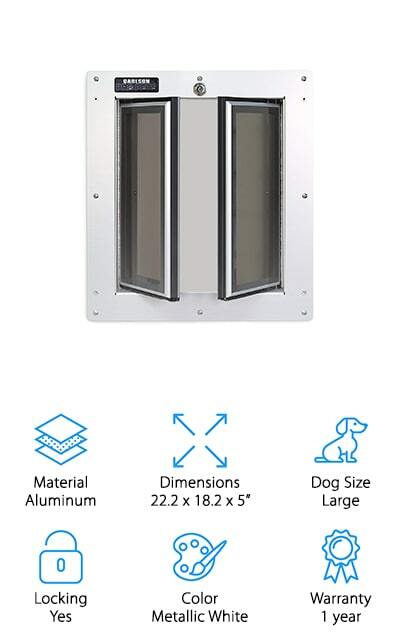 If you live in a climate with extreme weather or drastic swings between hot and cold, the Perfect Pet All-Weather Dog Door might be the right dog door for you. It was designed to keep the cold winter and humid summer air outside while helping to maintain your home at the proper temperature all year round. Structural components are made of energy efficient foam molded plastic and the double vinyl flap creates a 3-inch wide air pocket for insulation. The frame adjusts from ¾ to 1 ¾ inch so you can easily install it into different kinds of doors. There’s an optional kit available for wall installation, too, that can create up to a 9-inch tunnel. This door was designed for super large dogs that weigh up to about 120 pounds. 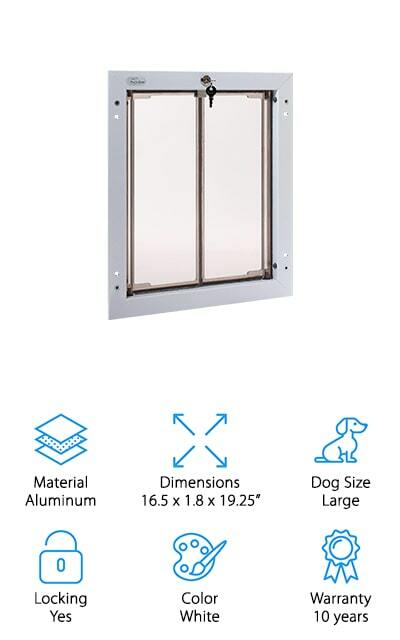 It’s not always easy to find a dog door for your deck but we think the best sliding glass dog door for your patio is the Ideal Pet Products Pet Door. This door feature double panes of tempered glass as well as a thick, durable flap with flexible joints for maximum energy efficiency. The flexibility also means that your pet's ears and tail won’t get trapped or pinched. This door also includes a locking kit that works in conjunction with your sliding glass door and it can be mounted on either a left or ride side opening. One more thing, this door was designed to fit vinyl sliding patio doors with tracks between 1 ½ and 1 ¾ inch wide. This door will not work with an aluminum sliding door. Next up in our best dog door review is the Plexidor Weatherproof Dog Door. Plexidoor is a brand we’ve seen before in our list but this door is designed for extreme weather climates. It can be installed into any standard exterior door, including those made of wood, steel, and fiberglass. Rather than a flap that will need frequent replacing, Plexidoor uses saloon-style flap doors made out of durable plexiglass which is stronger, thicker, and more durable than regular flap doors. That’s not all, they’re also lined with a high-density weather seal for added insulation and weatherproofing. This door was made to last a lifetime and comes complete with a 10-year warranty. One more thing, they even throw in a free eXtreme Dog Fence pet grooming glove with purchase. 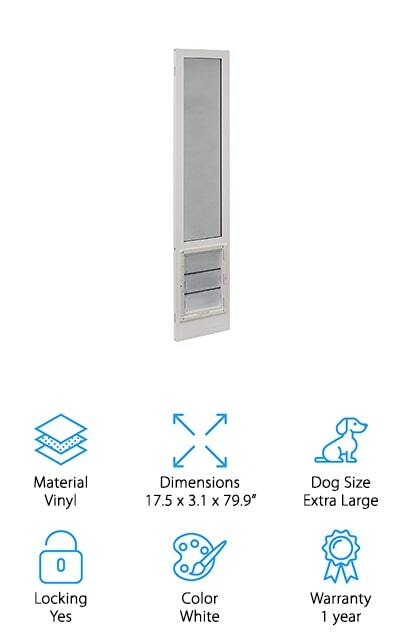 If you’re looking for the best dog door for wall mount, take a closer look at the Carlson Pro Pets Pet Door. The expanding tunnel fits walls from 4.75 to 7.5 inches thick and the aluminum frame is strong, durable, and won’t crack, rust, or chip. What’s really special about this one is the doors. They’re made of Lexan, a hard transparent plastic that’s so strong, it’s even used to make cockpit canopies and bulletproof screens. These doors are truly insulated and maintain a 30-degree difference between the indoor and outdoor temperatures which makes them a great choice for severe weather. And don’t worry about security, a safety lock, and stainless steel panel will keep you and your family safe when the door isn’t in use. Although our next pick is from Cat Mate, this one of the best dog doors around for small dogs like Yorkshire terriers, Pekinese, dachshunds. One of the coolest things about this door is that it has 4 different settings. You can set it to be open, in only, out only, or completely locked so you have a little control over whether your dog stays in or out. The rain and weatherproof external seals keep your home warm and dry and even has a magnetic closure to keep it shut. Installation is pretty easy, primarily because it comes with a stencil so you get the size just right. Just trace the outline of the hole before making the cut and you can be confident that you’ll get it right the first time. Next up is this awesome large dog door from Ani Mate. 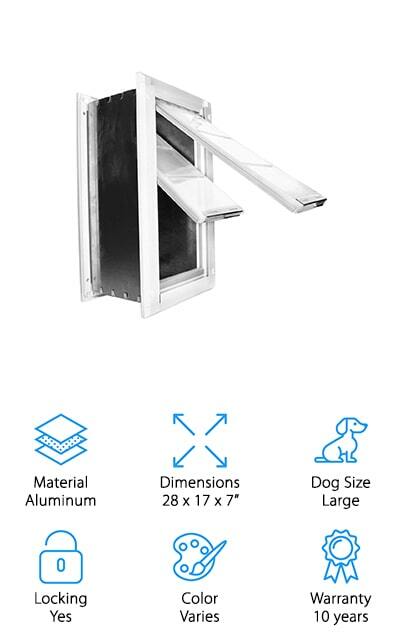 This one can be installed in doors and thin walls and is suitable for large dog breeds, like German Shepherds, golden retrievers, labs, or any dog with a maximum 25-inch shoulder height. The lightweight flaps are strong and durable but still really easy for your dog to push open. In order to prevent energy loss and help keep inside temperatures stable, the flap is brush sealed and has a magnetic closure that blocks cold winter air and summer heat from getting in. And don’t worry about security, this door has a locking panel for when it’s time to stay inside for the night so you can be sure that your dog is the only one using it. Last but not least is the BarksBar Original Dog Door. 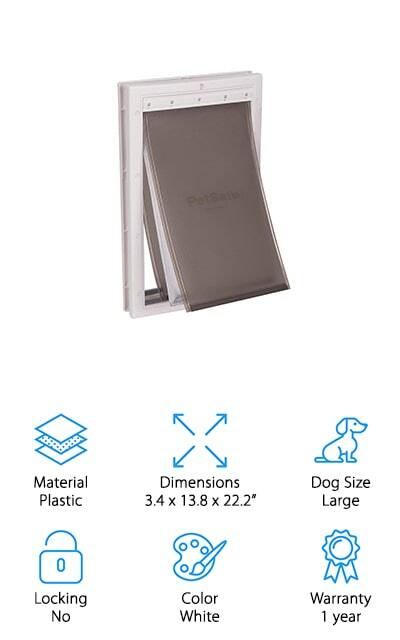 This durable white plastic and aluminum door is bite and chew-proof and durable enough for daily use of dogs weighing up to 100 pounds. The vinyl flap is strong but soft and flexible so your pet won’t have any trouble getting in and out of your home. It has a magnetic closure that helps keep out extremely hot and cold temperatures and won’t warp over time. As for security, this door comes with a removable self-locking panel that restricts the use of the door and keeps out drafts, bugs, and insects. The telescopic frame is easy to install and can be adjusted to fit into doors 1 ¼ to 2 inches thick and the aluminum edging gives this door a sleek, stylish look.